Reports - louthathleticss jimdo page! Sunday, 19 August, was a historic day for athletics in County Louth as the county’s men’s and women’s track and field teams recorded their best ever performances in the Athletics Ireland National League Final, which, as usual, was staged in Tullamore. The women’s team had qualified for the final of the top-tier Premier Division for the first time ever, taking their place among the top eight teams in the country. On the day they scored a total of 68 points to finish in seventh place. The previous best performance by the Louth women’s team in the Premier Division came back in 2014, when they finished in tenth place overall. The men’s team also performed very well to finish sixth in the Division One final with a total of 78.5 points. In 2014 and 2017 the Louth men had also finished sixth in this final, but with significantly lower points totals – 69 in 2014 and 68 in 2017 – so this year’s performance can justifiably be regarded as the best ever. The most impressive individual performance on the day came from Emily Rogers (St Peter’s) who finished joint first in the women’s High Jump. Second place finishes were recorded by Karen Costello (Dunleer) in the women’s 3000m and, for the men’s team, by Kieran McGrath (Drogheda & District) in the 800m, Conor Matthews (Dunleer) in the 1500m and Conor Durnin (St Peter’s) in the Triple Jump. Mary Leech (Drogheda & District) and Eva Cummins (Boyne) also scored strongly for the women’s team, finishing third in the 1500m and 3000m Steeplechase respectively, while Brendan Rogers (St Peter’s) crossed the line in third place in the men’s 3000m Walk. The other athletes on both teams also played their part with some excellent performances and can be very proud of their contribution to the teams’ success. Seoda Matthews (Dunleer), Shauna McMahon (Blackrock), Katelyn Quinn (Glenmore), Nicola Welsh (Dunleer), Geraldine Finegan (North East Runners), Sharon Olatunde (Dundealgan), Catherine Rogers (St Peter’s), Róisín Coade (Drogheda & District), Rosemary Gibson (North East Runners), Ashling Mathews (North East Runners), Ciara Reilly (Dunleer) and Mary Scanlon (Blackrock) all performed strongly for the women’s team. The men were well served by Tom Cummins (Boyne), Anthony Dillon (Dunleer), Andrew Kelly (Drogheda & District), Shane Larkin (Drogheda & District), Lee McGuinness (Drogheda & District), Conor McMahon (Ardee & District), Kevin Olandujoye (Dundealgan), Darren Weldon (Ardee & District), Eoghan Smyth (Blackrock), Gabriel Bell (St Peter’s), George Maas (Dundalk St Gerard’s) and Tom McGrane (St Peter’s). McGrane also acted as manager of both the men’s and women’s teams. A noteworthy feature of the Louth teams in the National League Final was their diversity in the sense that they included athletes ranging in age from 15 to 58 from no fewer than ten clubs across the county – a diversity which undoubtedly contributed to their history-making performances at the County Offaly venue. Detailed results are available on the 2018 Results page. Following their excellent start to their 2018 National League campaign in Belfast in June, the County Louth senior men’s and women’s track and field teams did not disappoint in their second round fixture at the Morton Stadium in Santry, Dublin, on Sunday, 8 July. The women’s team, who had only been promoted to the Premier Division this year following their second place finish in Division One in 2017, were particularly impressive this time, as they topped the points table among the seven teams competing in their group in Dublin. The men’s team also held their own in a very competitive group of six teams in Division One. Most importantly, both teams qualified for next month’s final in Tullamore by finishing among the top eight teams overall – the women were ranked sixth and the men seventh after the two qualifying rounds. In both cases they were comfortably ahead of the teams ranked ninth and lower, for whom the 2018 National League is now at an end. This is a particularly meritorious achievement by the women’s team, who have generally plied their trade in Division One. In their only previous campaign in the top tier – back in 2014 – they finished tenth overall after the first two rounds and hence did not advance to the final. The men’s team have been regular finalists in Division One in recent years, but have yet to earn promotion to the top flight. 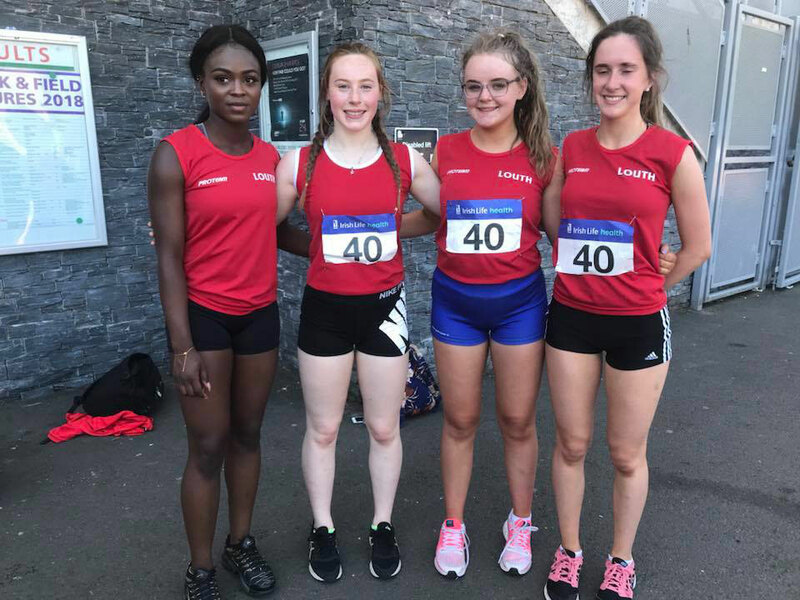 Four athletes scored maximum points by winning their events in Dublin – Nicola Welsh (Dunleer) in the 1500m, Emily Rogers (St Peter’s) in the High Jump, Amy McTeggart (Boyne) in the Long Jump and Conor Durnin (St Peter’s) in the Triple Jump. Several athletes also scored highly by finishing second in their events – Amy McTeggart in both the 100m Hurdles and Javelin, Geraldine Finegan (North East Runners) in the Pole Vault, Shauna McMahon (Blackrock) in the Discus, Ruarcán Ó Gibne (Boyne) in the 800m, Darren Weldon (Ardee & District) in the Hammer, Brendan Rogers (St Peter’s) in the Weight for Distance and the 4x400m team of Kelly Breen (Blackrock), Nicola Welsh, Amy McTeggart and Orla O’Connor (Drogheda & District). Third place finishes were recorded by Maria Smith (Dundalk St Gerard’s) in both the 100m and 200m, Orla O’Connor in the 800m, Karen Costello (Dunleer) in the 3000m, Catherine Rogers (St Peter’s) in the 1500m Walk, Conor McMahon (Ardee & District) in each of the 110m Hurdles, 400m Hurdles and Long Jump, Anthony Dillon (Dunleer) in the 100m, Lee McGuinness (Drogheda & District) in the 200m, Eoghan Smyth (Blackrock) in the High Jump and Tom McGrane (St Peter’s) in the Shot Putt. McGrane had a busy day as he was also the manager of both the men’s and women’s teams. The other athletes on the teams also played their part and can be proud of their performances; among them were Seoda Matthews (Dunleer), Rosemary Gibson (North East Runners), Sharon Olatunde (Dundealgan), Hannah Reilly (Blackrock), Niamh Fussey (St Peter’s), Andrew Kelly (Drogheda & District), Cormac Canning (Drogheda & District), Jamie Shiels (Boyne) and Destiny James (Dundealgan). The County Louth senior men’s and women’s track and field teams got their 2018 National League campaign underway in glorious conditions at the Mary Peters Track in Belfast on the last Sunday in June. The women’s team were up against six other teams in the Premier Division, having won promotion from Division One last year, while their male counterparts faced seven other teams in Division One for this first round fixture. The women proved that they were more than capable of making an impact in the top grade, as they finished second on points behind Dundrum South Dublin AC. The men’s team also performed very well as they finished third on the day behind City of Lisburn AC and County Meath. Both teams go into the second round fixture at the Morton Stadium in Santry, Dublin, ranked sixth overall and so are on target to qualify for the final by finishing among the top eight teams. Two athletes scored maximum points by winning their events in Belfast – Emily Rogers (St Peter’s) in the High Jump and Tom McGrane (St Peter’s) in the Shot Putt. McGrane had a busy day as he was also the manager of both the men’s and women’s teams. 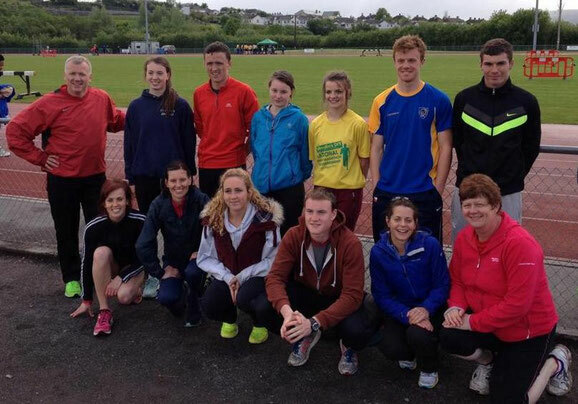 Several athletes also scored highly by finishing second in their events – Geraldine Finegan (North East Runners) in both the Pole Vault and Shot Putt, Mary Leech (Drogheda & District) in the 1500m, Shauna McMahon (Blackrock) in the Discus, Conor McMahon (Ardee & District) in both the High Jump and Long Jump, Ruarcán Ó Gibne (Boyne) in the 1500m, Conor Durnin (St Peter’s) in the Triple Jump and Darren Weldon (Ardee & District) in the Hammer. Third place finishes were recorded by Karen Costello (Dunleer) in the 3000m, Emily Rogers in the Hammer, Katelyn Quinn (Glenmore) in the Javelin, Lee McGuinness (Drogheda & District) in the 200m, Conor McMahon in the 400m Hurdles, Darren Weldon in the Discus, Brendan Rogers (St Peter’s) in the Weight for Distance and the 4x400m team of Lee McGuinness, Kieran McGrath (Drogheda & District), Andrew Kelly (Drogheda & District) and Ruarcán Ó Gibne. The other athletes on the teams also played their part and can be proud of their performances; among them were Maria Smith (St Gerard’s), Kelly Breen (Blackrock), Orla O’Connor (Drogheda & District), Hannah Reilly (Blackrock), Eilish Brady (St Peter’s), Rosemary Gibson (North East Runners), Sharon Olatunde (Dundealgan), Sarah Clarke (Blackrock), Nicola Welsh (Dunleer), Shane Larkin (Drogheda & District), Tom Cummins (Boyne), Kevin Oladunjoye (Dundealgan) and Anthony Dillon (Dunleer). 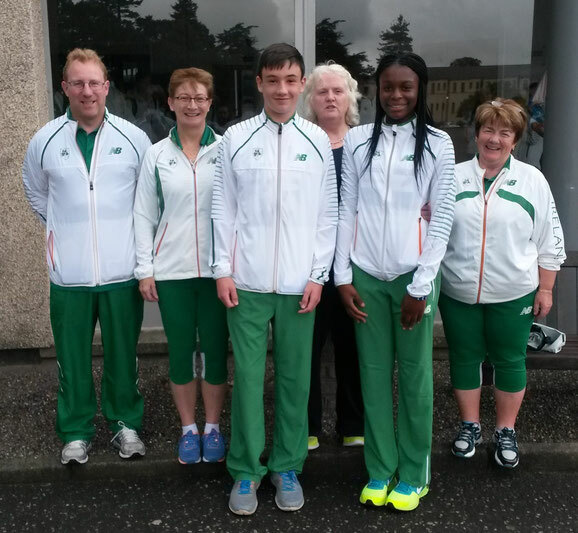 The biennial Athletics Ireland Congress was held in Carrick-on-Shannon recently. 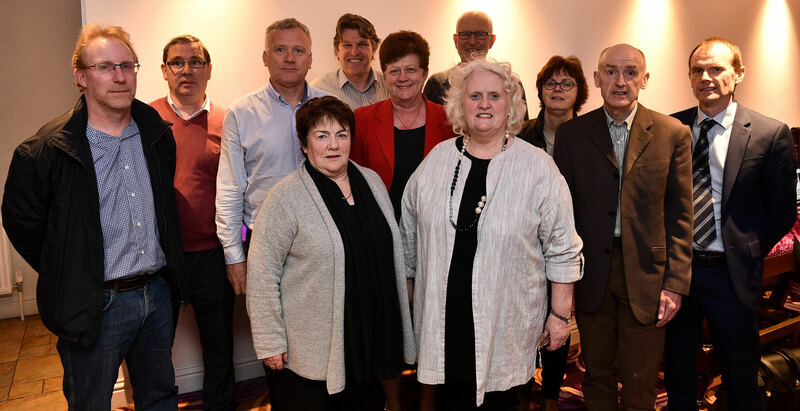 Georgina Drumm of Mountpleasant AC was re-elected unopposed as President of the sport’s national governing body and will now serve for a second two-year term. Dunleer AC’s Fintan Reilly was elected to both the High Performance committee and the Coaching and Development committee, while Ciaran Doyle of Drogheda and District AC was elected to the Juvenile committee. County Louth had a strong representation at Congress with Simon Allen (North East Runners), Dermot Barry (Glenmore AC), Pat Cheshire (Dunleer AC), Christian Maas (Dundalk St Gerard’s AC), Kathleen McConnell (St Peter’s AC), Tom McGrane (St Peter’s AC), Deirdre McTeggart (Boyne AC), Catherine Muckian (Dundealgan AC) and Micheal Mulligan (Dunleer AC) also in attendance as delegates. The Wee County had one motion on the agenda and this was passed unanimously. As a result of this successful motion, U12 and U13 teams will now run a 4x200m rather than a 4x100m relay in indoor championship competition. A County Louth amendment to a County Kilkenny motion also met with unanimous approval from the delegates, who numbered almost 200 in total. This means that the newly introduced women’s weight for distance event will now be on the programme for U23 athletes, as well as for the U20, Senior and Masters age groups as originally proposed. 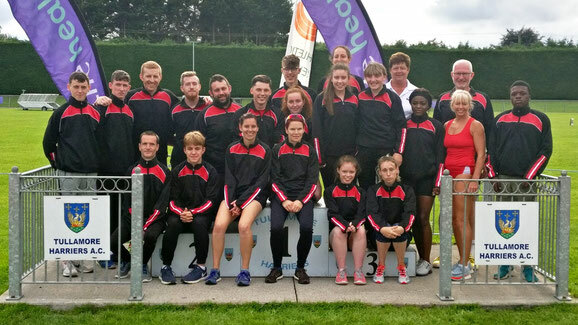 The County Louth senior athletics teams enjoyed a very successful day in Tullamore on Sunday, 20 August, when they did battle in the final of the National League. Both men’s and women’s teams were competing in Division One of this All-Ireland competition and both matched their previous best performances. In 2016 the women had finished seventh and the men eighth, but there was a clear improvement by both teams this year. The women led the way by finishing second of the eight teams who had qualified for the final, matching their achievement of 2013, while the men finished in sixth place, as they had previously done in 2014. By finishing second, just one point ahead of the County Kerry team, the Wee County’s women’s team earned promotion to the top-tier Premier Division for next year’s competition. Heptathlete Amy McTeggart (Boyne) contributed very strongly to the women’s success, winning the High Jump, and finishing second in the 400m and third in the Triple Jump. The other individual victory went to Shauna McMahon (Blackrock) in the Shot. Another heptathlete, Geraldine Finegan (North East Runners), scored good points by finishing second in the Javelin and third in the Pole Vault. Two other athletes enjoyed a top three finish in their individual events – Emma Cheshire (Dunleer), who was second in the Long Jump, and Niamh Belton (Dundalk St Gerard’s), who came home third in the 200m. The women’s 4x100m team of Cheshire, Belton, Kelly Breen (Blackrock) and Bláthnaid Donnelly (Drogheda & District) also finished in third place, pipping their counterparts from Kerry by less than one hundredth of a second, which proved decisive in deciding the second of the two promotion places. Had the teams even dead-heated for third place in that race, it is Kerry who would have won promotion instead of Louth. Of course, with such a tight margin between the teams, it is not just the 4x100m team who deserve special mention. The contribution of the remaining four athletes on the team was also of vital importance, as Nicola Welsh (Dunleer), Erin McHugh (Drogheda & District), Seoda Matthews (Dunleer) and Emma Conway (Dundealgan) all played their part on a great day for athletics in County Louth. The star performer for the men’s team was Conor McMahon (Ardee & District), who was joint first in the High Jump. Oisín Ó Gibne (Boyne) finished second in the 800m, as did Darren Weldon (Ardee & District) in the Hammer. Ruarcán Ó Gibne (Boyne) came home third in the 3000m Steeplechase and the other third place finisher for Louth was Lee McGuiness (Drogheda & District) in the 200m. As was the case for their female counterparts, every single point earned by the Louth men’s team was of vital performance in securing their sixth-place finish, as the seventh placed team, Slí Cualann from County Wicklow, finished with the same points total only to lose out to Louth under the league’s tiebreaking rules. Hence the points earned by the rest of the men’s team – Gabriel Bell (St Peter’s), Sam O’Neill (Drogheda & District), Pat Cheshire (Dunleer), Tom McGrane (St Peter’s), Jonathan Rice (Dundealgan), Stephen Kelly (Drogheda & District) and Andrew Kelly (Drogheda & District) – were every bit as important. 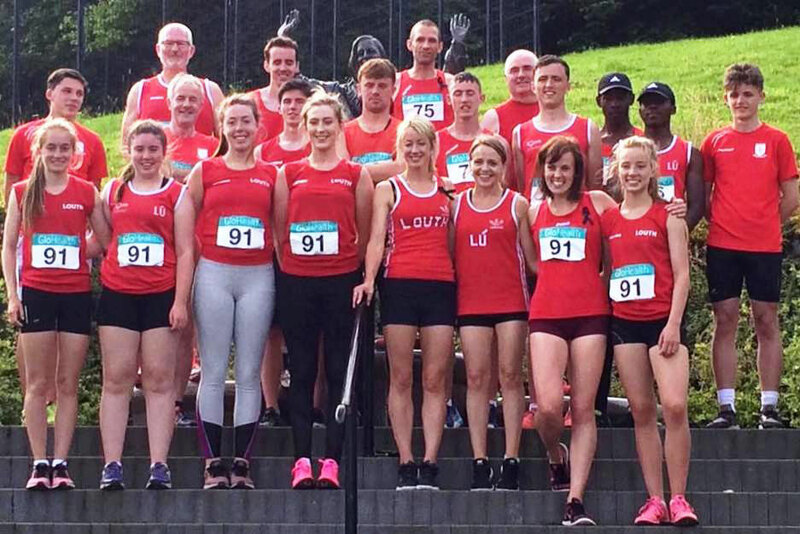 Following some very impressive individual performances and, more importantly, a great team effort in the qualifying rounds earlier this summer, the Athletics Louth men’s and women’s track and field teams both qualified for the Division One final of the National League. The final itself was staged in Tullamore on Sunday, 7 August – a day on which the distinctly autumnal conditions were not conducive to top class performances. The standard of competition in the final was very high but, nevertheless, a number of the Louth athletes managed to finish in the top three in their events. Drogheda & District AC pair Lee McGuiness and Mark O’Shea claimed second place in the 200m and 1500m respectively, a feat which was matched by Boyne AC pair and cousins Amy McTeggart and Niamh Kelly in the High Jump and Shot Putt respectively. McTeggart also finished third in the 400m, as did Sam O’Neill (Drogheda & District) in the 800m, Mark Rogers (St Peter’s) in the 400m Hurdles, Dunleer AC’s javelin throwing siblings Liam and Niamh Connaughton, Geraldine Finegan (North East Runners) in the Pole Vault and Emma Cheshire (Dunleer) in the Long Jump. The Louth men’s team finished in eighth place overall with Conor McMahon (Ardee & District), Andrew Kelly and David Walsh (both Drogheda & District), Mubarak Ishola, Gerry McArdle and Moses Opebi (all Dundealgan), and Conor Durnin, Martin McGrane, Tom McGrane and Brendan Rogers (all St Peter’s) also contributing to the points total. The Wee County’s women’s team went one better than their male counterparts to finish seventh overall. Valuable points were scored by Róisín Coade, Mary Leech and Erin McHugh (all Drogheda & District), Seoda Matthews (Dunleer), Laura Mathews (North East Runners), and Eleanor Hoey (St Peter’s). 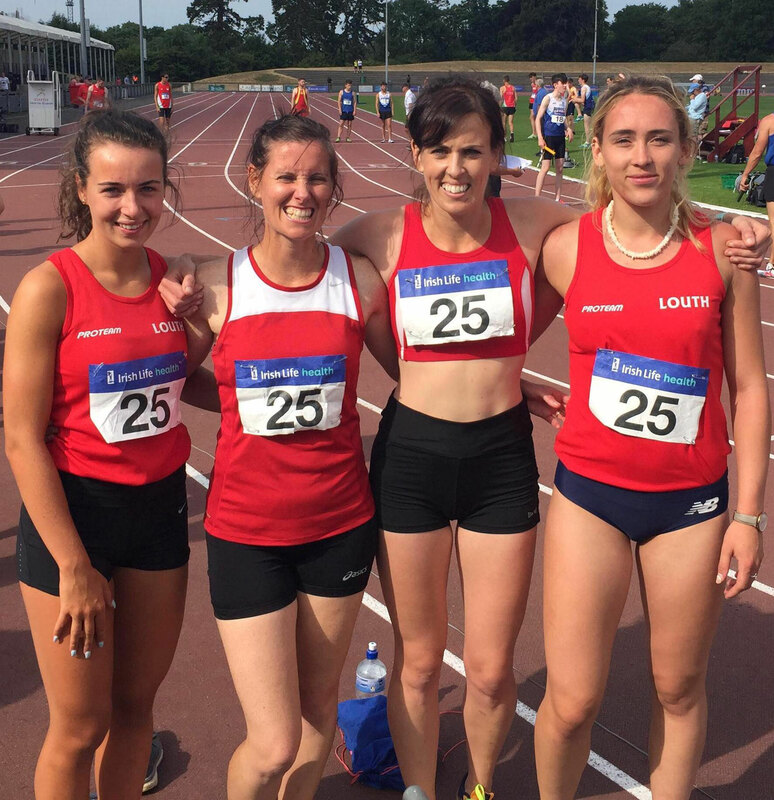 A number of other athletes had represented Louth in the qualifying rounds in Dublin in June and in Belfast in July, and their performances helped both men’s and women’s teams qualify for the finals. These were Shauna McMahon (Blackrock), Eva Cummins, Oisín Ó Gibne and Zoe Shiels (all Boyne), Orla O’Connor (Drogheda & District), Niamh Belton (Dundalk St Gerard’s), Jonathan Rice (Dundealgan), Garry Campbell, Shane Cheshire and Darragh Greene (all Dunleer), Paul McGlynn (Glenmore), and Emily Rogers (St Peter's). Full results are available on the Results 2016 page. The Celtic Games took place the day before the National League final. Swansea in Wales was the venue this year for the annual triangular track and field international at Under 18 and Under 16 level involving Ireland, Scotland and Wales. It proved to be a great day for Ireland as the boys and girls in green won six of the seven trophies on offer: U18 Boys, U18 Girls, U16 Girls, Overall Boys, Overall Girls and Overall Team. There were no Louth athletes on the team this year, but Ciaran Doyle of Drogheda & District AC was the team manager and Kathleen McConnell of St Peter’s AC was the coach for the shot putt and javelin events. 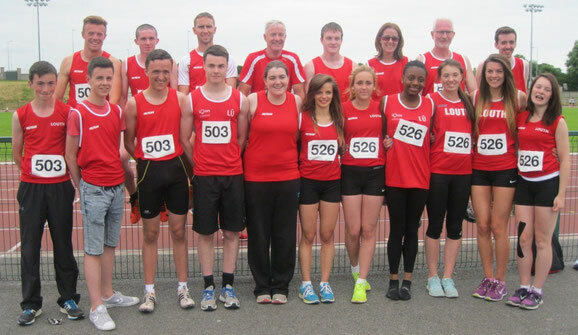 Well done to all the Louth clubs who came together for the AAI National League. Both the men's and women's teams finished in the top eight in Division 1 and hence have qualified for the final in Tullamore on Sunday, 7 August! Mubarak Ishola and Jonathan Rice (both Dundealgan) were also on the men's team - they both ran in the 4x100m. Once again the clubs in the Wee County came together to form teams for the Athletics Ireland National Track and Field League. Many thanks to the athletes from Ardee and District, Blackrock, Boyne, Drogheda and District, Dundalk St Gerard's, Dundealgan, Dunleer, Glenmore and St Peter's who took part. The men's team exceeded expectations to lead the pool right throughout the day. After the top 15 events where taken into account, the men were in third place with just a point separating the first three teams - which puts them in a good position for Round 2 on July 17th. Our women's team placed fifth and are ready to move up again in Round 2. There were individual wins for Conor Durnin (St Peter's) in the Triple Jump, Liam Connaughton (Dunleer) in the Javelin, Conor McMahon (Ardee & District) in the Long Jump and Amy McTeggart (Boyne) in the Javelin. There were second place finishes for Darragh Greene (Dunleer) in the 800m, Mark Rogers (St Peter's) in the Pole Vault and Tom and Martin McGrane (St Peter's) in the Hammer and Shot Putt respectively. For the women's team there were second place finishes for Mary Leech (Drogheda and District) in the 3000m, Emily Rogers (St Peter's) in the High Jump and Shauna McMahon (Blackrock) in the Discus. Third places were achieved by Lee McGuinness (Drogheda and District) in the 100m and 200m and also by Mark Rogers in the 110m Hurdles and High Jump along with Amy McTeggart and Niamh Kelly (Boyne) in the Triple and Long Jump respectively. Also competing well and scoring valuable points for the team were Gerry McArdle and Moses Opebi from Dundealgan, Zoe Shiels, Eva Cummins and Oisín Ó Gibne from Boyne, Mark O'Shea, Orla O'Connor and Róisín Coade from Drogheda and District, Niamh Belton from Dundalk St Gerard's, Seoda Matthews from Dunleer and Paul McGlynn from Glenmore. The 2016 AGM was held on Monday, 18th January 2015. Details of the newly elected officers are on the Contact Us page. 1. That the longer races for the U9 and U10 boys and girls in the Louth Track and Field Championships be changed to 300m (U9) and 500m (U10), in line with the National Children's Games races for these age groups. In the event that heats are required due to numbers the result to be decided by time. 2. In Cross Country, only an athlete who wins the Intermediate Championship will be re-graded to Senior status. 3. That Athletics Louth reintroduce summer juvenile track and field competitions to be held on weeknight evenings in July and/or August at suitable venues to provide club athletes with more opportunities to compete post-county and provincial championships. 4. Athletes who have lost their county Novice or Intermediate status for at least 5 years can apply to be re-graded. The meeting to consider re-grading applications will be held once per year at the September county board meeting. 5. That the position of County Competition Secretary be divided into two: 1) Cross Country and Road & 2) Track and Field. 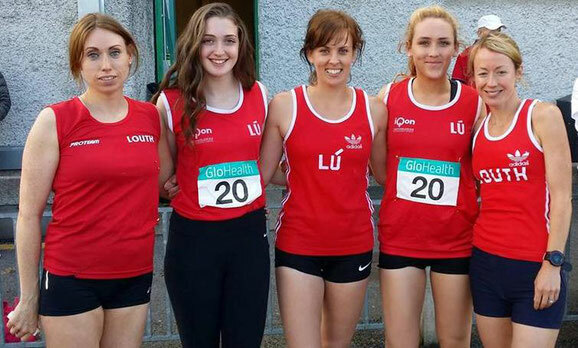 There was a strong County Louth involvement in the Irish team in the 2015 Celtic Games, which were staged on Saturday, 1 August. This is an annual international track and field match at Under 16 and Under 18 level between Ireland, Scotland and Wales, with the venue rotating between the three countries. This year it was the turn of Scotland to act as hosts and the event was staged in Grangemouth, near Falkirk, in central Scotland. Patience Jumbo Gula (Dundalk St Gerard’s AC) enjoyed a magnificent victory in the U16 Girls’ 200m. Her winning time of 25.18 seconds was faster than her personal best of 25.33, although it was aided by a wind marginally over the allowable limit of 2.0 metres per second. She finished 0.39 seconds clear of Welsh athlete, Gabrielle Fakande, and 0.49 clear of the Scot, Kate Johnstone. Patience was also part of the Irish U16 mixed 4x100m relay team, which was unfortunately disqualified due to a baton change outside the changeover zone. However she did have the satisfaction of leading the Irish U16 Girls’ team to victory in the match against their Celtic rivals. It should be noted that Patience will still be eligible to compete in the U16 age group in next year’s Celtic Games, which are due to be staged in Wales. Liam Connaughton (Dunleer AC) was in action the U16 Boys’ Javelin and he performed very well to claim second place with a throw of 49.69m behind Scottish athlete Alex McFarlane, but ahead of Wales’s Max Holland. Just like Patience, this young athlete has a very promising future ahead of him – he recently recorded a new championship best performance when setting a personal best of 52.85m with the 600g implement to win the Irish U16 title. The Irish U16 Boys’ team finished in second place overall behind the hosts. Four officials from County Louth also travelled to Scotland with the Irish team. Georgina Drumm (Mountpleasant AC) played a key role as the Celtic Games co-ordinator. Ciaran Doyle (Drogheda & District AC) and Kathleen McConnell (St Peter’s AC) were both throws coaches, while Angela McDonald (St Peter’s AC) was the long jump coach. The 2015 AGM was held on Monday, 12th January 2015. Details of the newly elected officers are on the Contact Us page. There will be some changes to the Louth Cross Country Championships as a result of motions passed at the AGM. It is planned to review these changes in 2017. 1. The distance of the Senior Women's race increases from 5000m to 6000m. (iv) Over 35 Masters' Women. 3. A new team race is introduced in the Over 50 Masters' Women category with 3 athletes to score. 4x400m – 3rd Athletics Louth – Jamie Shiels (Boyne), Mark O’Shea (Drogheda & District), Mark Rogers (St Peter’s), Garry Campbell (Dunleer) – 3:34.98. It should be noted that the times and distances recorded in several events were adversely impacted by the very wet conditions which prevailed earlier in the day. Great credit is due to all ten athletes, team manager Fintan Reilly among them, for their excellent performances. It had been feared that the county was fielding a significantly weakened team due to the unavailability of some of those who had been considered for selection, but these fears were confounded by those who proudly wore the red of Louth on the day. The team’s achievement is all the more praiseworthy when it is considered that Mark Rogers was also competing in the Senior Men’s Decathlon, in which he won the bronze medal, in the National Combined Events’ Championships which were scheduled alongside the National League Final. This meant that it was unrealistic for Mark, who is habitually Louth’s top points scorer in league competition, to represent the county in his three strongest events in the League Final. 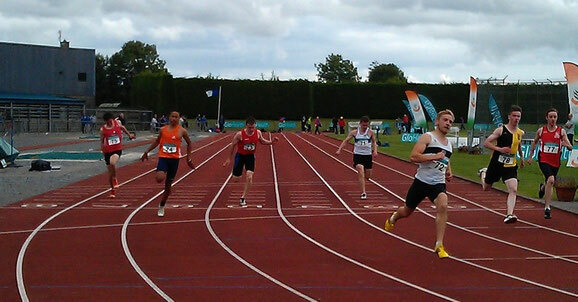 The parallel scheduling of the two competitions did put Louth at a disadvantage, as no other team in the Men’s Division One Final had any of their athletes competing in the Combined Events’ Championships. Eleven other athletes also deserve credit for playing their part in the National League qualifying rounds in Sligo (managed by Pat Cheshire) and Athlone (managed by Fintan Reilly) and thus helping Louth to qualify for the final. These are Luke Callaghan (Boyne), Patrick O’Grady and David Walsh (both Drogheda & District), Jack Boylan, Pat Cheshire, Shane Cheshire, Patrick Connolly and Darragh Greene (all Dunleer), Scott Dorian (St Gerard’s), and Conor Durnin and Brendan Rogers (both St Peter’s). The Louth Senior Women’s team had finished in second place in Division One in last year’s National League Final and thus earned promotion to the Premier Division for this year’s competition. Managed by Ciaran Doyle, they did very well against tough opposition in the two qualifying rounds and ended up being ranked in tenth place overall, missing out on one of the eight spots in the final by just a few points. However they were comfortably clear of the relegation zone and easily retained their Premier Division status for 2015. The thirteen women who contributed to this fine achievement were Joy Akpe-Moses and Annabelle Morris (both Blackrock), Amy McTeggart and Deirdre McTeggart (both Boyne), Pamela Howard, Mary Leech and Orla O’Connor (all Drogheda & District), Helen Cheshire and Nicola Welsh (both Dunleer), and Chloe Finley, Niamh Fussey, Emily Rogers and Frances Rogers (all St Peter’s). Both the men’s and women’s teams have improved their league standing each year since 2012 and, with athletes born in 1999 becoming eligible to compete as seniors for the first time in 2015, it should be quite realistic to target a top-eight finish for the women in next year’s Premier Division and a top-three finish for the men in Division One. Louth clubs came together once again for Round 2 of the AAI National League in Athlone on Sunday 22nd June 2014. Our ladies just missed out on qualifying for the Final, finishing in 10th place overall, but comfortably retained their place in the top-tier Premier Division for 2015. Our men finished in 7th place overall to qualify for the Division One Final for the second year in a row. Many thanks to the athletes from Blackrock AC, Boyne AC, Drogheda & District AC, Dunleer AC, St Gerard's AC and St Peter's AC, and hope to see all the men out again for the Final in Tullamore on Sunday 3rd August. Louth clubs came together once again for the AAI National League in Sligo on Sunday 18th May 2014. Our ladies stepped up to Premier and acquitted themselves very well amongst the best of the athletes in the country and will push hard for a place in the final. They currently lie in 9th place overall, just 4 points behind the 8th place team. Our men exceeded expectations with some top class performances and will look forward to consolidating their position in the next round. They currently lie in 7th place overall. There were many highlights in particular a stunning run by the ladies' 4x400m team. Many thanks to the athletes from Blackrock AC, Boyne AC, Drogheda & District AC, Dunleer AC and St Peters AC, and hope to see all out again for Round 2 on June 22nd. 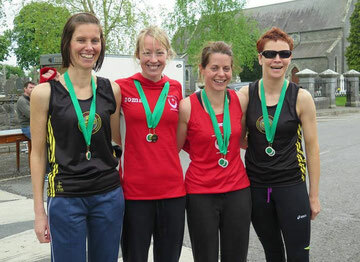 Congratulations to the Louth team of Nicola Welsh, Mary Leech, Pamela Howard and Karen Costello (pictured left) who won the inter-county team gold medals at the Leinster Novice Road Race Championships in Gowran on Monday 5th May 2014. There was also individual success for Pamela and Nicola who finished in second and third places respectively. Congratulations to all the athletes , coaches and families who travelled to Bush Track for the Pre Championship Event on Friday 20th April. It will be a night that will be remembered for a long number of years, the event started in sunshine and finished with hail stones with a temperature akin to winter. Sterling work was done by the officials to get as much done as was possible, thanks to all. See results section for full list of completed events. Juvenile Track & Field Championships of Ireland 5 Gold, 6 Silver, 4 Bronze for Louth Athletes . County Senior Junior Masters Track 2010.